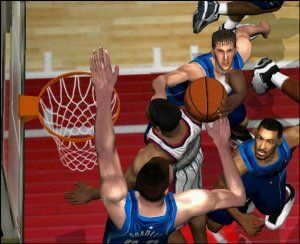 Step up to Microsoft's first sports outing on the XBox. And before you shiver, I am here to tell you that this game rules. However, first things first: I have to tell you probably the worst part of the game so it's out of the way. The crowd, the crowd, the crowd. Forget about playing in a packed stadium with throngs of excited 2D spectators as per the usual titles. You are playing to a host of hell's minions, of that I am certain. It's amazing considering the level of quality of the rest of the game that the crowd is so bad. For my example, I hold up screenshot #1: Even though the picture is small you can see white dots where the faces are. That's how they look ingame folks. Faceless demons just waiting for you to join them. 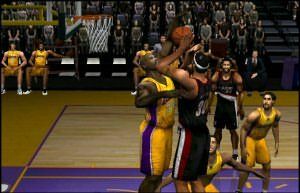 With all that said, that is a very small thing in a fantastic sporting game not done by Electronic Arts, the undisputed rulers of the sports title. Whilst not pushing the XBox to the limits as far as graphics go, (and why would you need to in a basketball game), NBA Inside Drive is extremely pleasing to look at with accurate modelling of player faces and nice effects courtside. Animations abound and you can enjoy a very wide variety of moves from your players, the crowd and even players on the sideline to the action. Another good point is that players are recognisable right down to little details like tattoos and body shape! The title has the current roster of the NBA, and an indepth micro management system that will allow you to step outside the normal basketball title and draft, trade and sign players, making this an extremely well rounded game that has an extremely long life in your XBox. The controls are very well realised and totally suited to the XBox controller. There is rarely any fumbling for the correct button and within a short amount of time you will find yourself truly in charge of the destiny of your selected team. An impressive feature of the title which currently sets it apart from others on the market, is the ability to call the teams plays on the fly using your XBox controller directional pad. This has been done before, however with Inside Drive you can tighten that control by a series of double presses for extra responses by your team. You can also just have the plays set to auto as I found that I was losing track of my team and running them ragged for no reason at all. However for the hoop head in us all, the manual play call is a dream feature that can raise your team's performance to great heights. Just stay on track of what your team is doing at all times. As with many of these titles, an on the fly game strategy is an important step to being successful. Pause the game to take advantage of the coaching menu. Look around the court and see if your AI team mates have broken loose from their defenders and are calling for the ball. 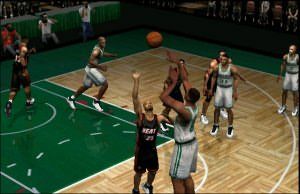 Pass shots are usually accurate in this title but as with anything, pick the moment to pass or you could find the ball being slapped into the hands of your opponent. This is where you can take advantage of the analogue sticks to fully realise ball direction and avoid unnecessary mistakes. The games sounds nice with all the usual commentary and court noise thrown in. The crowd does not take away from the action and actively participates in clever plays or points scored. The banter between commentators does not appear forced other than when dealing directly to fitting a players name within a complex sentence. There is just a slight pause to the speech. Music is the prerequisite hip hop tunes as enjoyed in almost every basketball game. The addition of some original material was extremely enjoyed and welcome. 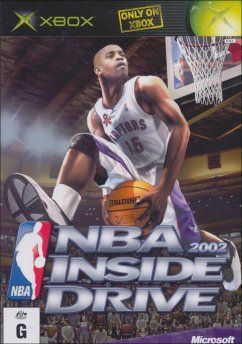 NBA Inside Drive is a fantastic addition to the XBox sporting line-up and currently one of the strongest basketball titles on the market on any platform. The ease at novice players can pick up the title and gain proficiency is fully worth the price of the game. The indepth management side will also make it a must buy for fans of the NBA.